So Kristophersson beats Loeb to 1st place by 1 point after Q4. Loeb was 'taken out' by Ekstrom in Q3, but for me it was a racing incident. What an end to SF2 ... crazy Loeb mistake and fight to the line with Timur ! Action packed weekend, plenty of incidents to discuss. The Loeb/EKS struck me as a racing incident, if anything more as a result of Loeb drifting wide. Great to see Baumanis in the final but it highlighted how far off the pace those guys are that he finished so far down. 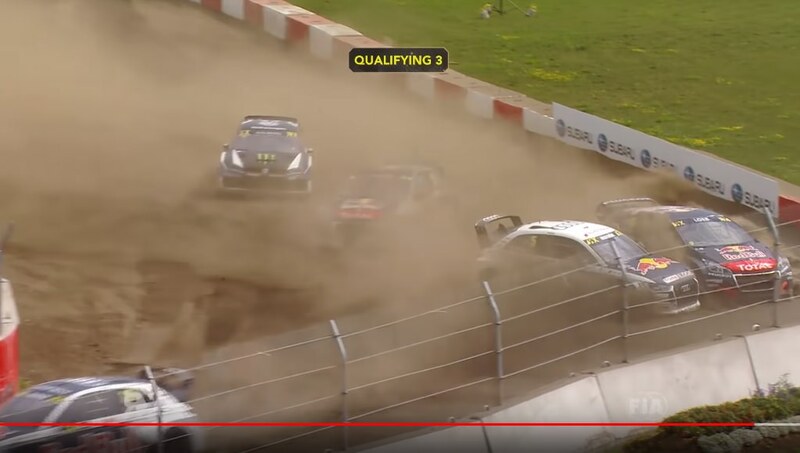 Very nearly an epic drive from Bakkerud in the semi too, I wonder if he had let off a bit once he was down in 4th (i.e could he actually have been close enough to take advantage of Loeb's mistake). Really got me hyped for my visit to Latvia next month. A great event overall and nice to see Audi and Peugeot closer to the VW. But Kristofferson, he's the ultimate professional. It may seem a little dull, in terms of headlines, that he wins all the time. But in the future, this will be looked back upon as the making of a legend. To win the event from 9th after Q2 is impressive. And it wasnt due to any VW car-superiority as the Peugeots and Audis were now pretty much equal on pace. A shame for Loeb though, it would've been good to see if he could win without those mistakes. Curious to see how eWRX will evolve. For now it’s amazing how fast the changes were decided and how easily manus accepted the use of a common chassis; like in Formula E, it seems it’s more about marketing and getting ASAP into EV’s hysteria than really trying to improve the sport. Only Loheac or French in general..? I think he's referring to the sport in general, however people have to ask themselves whether the whole sport is in danger as a result of eRX, or just the WRX. In that article he complains about electric, but also that privateers are driven out by the high cost as a result of having manufacturers involved. Surely if that's the case then having the manufacturers focus on eRX is a good thing? They can go and do that while all the privateer teams (Munnich, DA, probably OMSE, Pucher etc.) can have a championship more like European Rallycross used to be. Difficulty will be getting a promoter. Interesting that people like circuit owners are speaking out against WRX/IMG, according to the Albatec website "average reach across all platforms per event rising from 430,000 in 2013 to 6.7 million in 2014 and live event attendance was another success story with a 130% increase in fans attending races in 2014." so places like Loheac have almost certainly benefitted, if only in the short term. He mostly complains about events organizers not being listen about eWRX sudden introduction (it was supposed to be a step by step process) and the lack of future for private teams in it, like you've mentioned. I hate to say this, but apparently, GRC's YouTube channel has been deleted..